Cryosphere - The portions of the Earth's surface where water is in solid form. I've never been a fan of winter. It's a main reason I moved to the Caribbean for most of my adult life. After moving back to the midwest to be near family, I'm again subject to the cold, dark and dreary days of winter, where colds, flu and sickness abound. A mild depression sets in as soon as fall rolls around and this bleak season begins. The weather this year has been bitterly cold at times and the water of the local lakes, streams and ponds are frozen several inches thick. Much thicker than normal for this area. 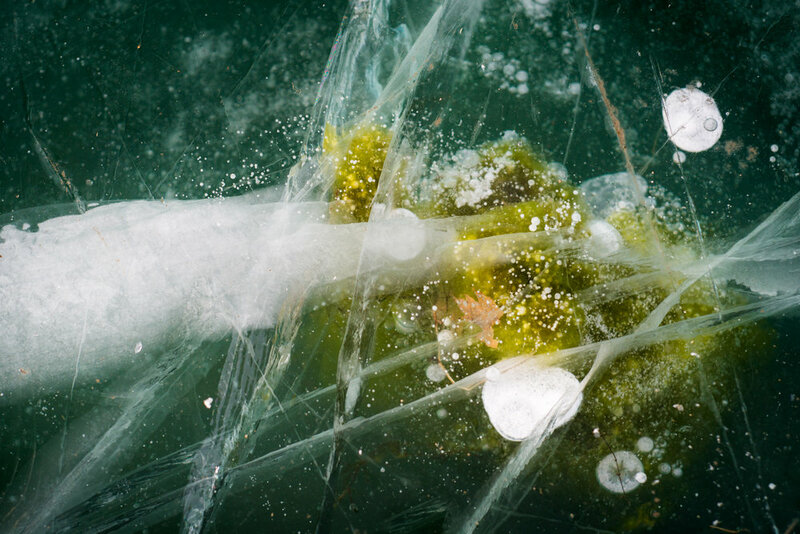 In an attempt to appreciate the beauty of winter and hopefully change my mindset, I photographed the mesmerizing shapes, cracks, bubbles and even frozen fish of a local pond. While I can certainly appreciate the beauty of the ice, I'm not sure it's changed my mind as a whole regarding winter. Although this project may not have worked to change my opinion, I'll continue to try and appreciate a season that I have no love for and if nothing else, appreciate it for the fact that it's needed in order to usher in spring.